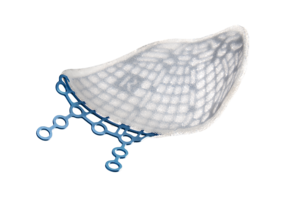 The MEDPOR Orbital product line consists of implants to fit individual patient needs. 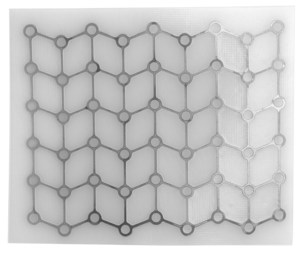 To determine the safety and efficacy of using porous high-density polyethylene (PHDPE) in the repair of orbital defects. Academic tertiary care trauma center. Patients One hundred seventy patients with orbital defects requiring surgical repair. Intervention Orbital defect repair with PHDPE. Main Outcome Measure Our review documents surgical results and complications associated with the use of PHDPE. There was a 6.4% complication rate associated with the use of PHDPE. The infection rate was 1.8%. The persistent orbital malposition rate was 3.5%. The extrusion rate was 0%. This report represents the largest case series in the literature using PHDPE for orbital reconstructions. The use of PHDPE resulted in a low complication rate and excellent functional and cosmetic reconstructive results. Because of our success with the use of PHDPE, we have changed our clinical practice to minimize the use of autologous graft material, thereby eliminating donor site morbidity in cases involving orbital reconstruction. To evaluate our initial experience with a porous polyethylene implant with embedded titanium in orbital reconstruction. 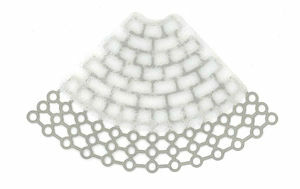 A retrospective review of the charts was performed for patients receiving at least 1 orbital porous polyethylene implant with embedded titanium from October 2004 through April 2006. Patient demographics, implant type and size, method of fixation, postoperative complications, and length of follow-up were recorded. One-hundred six patients received at least one embedded titanium implant (80 men, 26 women). Age ranged from 3 years to 85 years (mean, 31 years). Indications included orbital fracture repair (102 patients), correction of enophthalmos (3 patients), and reconstruction after tumor resection (1 patient). The average floor implant used was 22.3 mm wide by 27.9 mm long. The average medial wall implant was 13.6 mm tall by 22 mm long. Implants were fixated with 1 or 2 microscrews in 75 patients (70.8%) and placed without fixation in 31 patients (29.2%). Four postoperative complications were noted: a retrobulbar hemorrhage on postoperative day 3 that resolved without sequelae, a vertical overcorrection requiring removal of the implant, a transient oculomotor disturbance, and a screw placed in proximity to the infraorbital nerve canal resulting in hypesthesia and chronic pain that required removal of the screw. In the 3 complications potentially related to the implant, the embedded titanium allowed postoperative implant visualization and guided subsequent management. No implant extrusions or postoperative infections were noted. 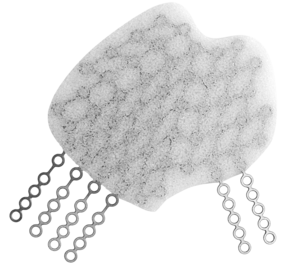 Porous polyethylene implants with embedded titanium provide a new alternative to alloplastic implant materials for orbital reconstruction with a profile that combines several advantages of porous polyethylene and titanium implants.